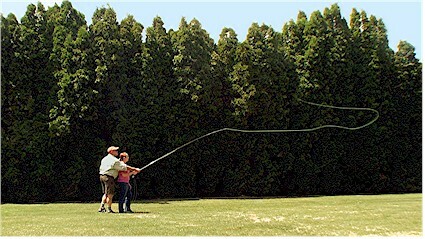 fly-casting: the act or technique of casting with an artificial fly as the lure, the rod used being longer and more flexible than that used in bait casting. Over the years, Tim Irish has developed a teaching tool and system that simply introduces fly casting to the beginner or intermediate fly caster. Tim also has an unbelievable ability to quickly identify specific casting problems that people acquire during their fly fishing careers. His one hour tune up will focus on repairing those problems making you a better fly caster and a much better fly fisher. Much like a golf pro works to adjusts your swing, Tim works one on one with each student to provide you with the necessary elements and skills needed to practice and hone your fly casting abilities. The tune up focuses on straight line casting, line speeds, and shooting line properly. Each one of these specific casting categories can be adjusted and tailored to meet your specific needs. The One Hour Tune-Up is recommended to many of our Worley Bugger guiding customers, especially to those individuals that are new to the sport of fly fishing. This insures they have the proper knowledge of casting and equipment before drifting the Yakima River for their first time. The One Hour Tune Ups with Tim can be scheduled prior to your trip. Simply ask about it while booking your guided fly fishing trip or call the pro shop to arrange one prior to your trip. To schedule your own One Hour Tune Up session with Tim Irish, simply call the pro shop in Ellensburg to arrange one. The Tune-Ups are available seven days a week and can be personalized to meet your specific schedule. Tim Irish, head instructor for the Worley Bugger Fly Co., Fly Fishing Education courses will be your Tune Up instructor. Listen well, but more importantly ask any and all questions. The 1-hour casting tune up sessions are held at a local Ellensburg city park close to the Worley Bugger pro shop, where casting on grass without obstructions can be accomplished. One Hour Tune Up's with Tim Irish are available any day of the week and can be schedule throughout the day. Please call the pro shop in Ellensburg prior to reserve your hour slot. To refine and hone your casting skills producing a better fly caster and an improved fly fishermen.